The World Cancer Research Fund along with its partners the American Institute for Cancer Research have published their updated guidelines regarding the links between food, nutrition, physical activity and cancer. This latest publication, published in 2018 is the 3rd comprehensive report. The last one was published in 2007. 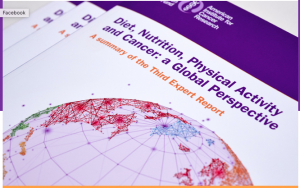 The cover of the Diet, Nutrition, Physical Activity and Cancer: A Global Perspective 3rd Expert Report, published by the World Cancer Research Fund. I’ve already received my hardcopy publication, but you can also access all of the findings on-line in the links I’ve provided below. This includes during childhood as well as adult years. This can be a challenge as the typical trend for many adults is to gradually put on weight as they age. Maintaining your adult weight is important and can become more challenging as you get older and many women can notice a distinct shift after menopause.Be physically active. Hopefully the increased activity will help to control your weight, but even if it doesn’t, keep going! That’s because exercise itself, even without weight loss, can help reduce insulin levels, reduce estrogen and testosterone levels and reduce inflammation. 3. Eat a diet rich in wholegrains, vegetables, fruit and beans! This one is my favourite recommendation – As I like to say…what you eat matters! When you think about food, you can divide it into two broad categories and ask yourself, does it come from a plant or does it come from an animal? Most of the food you eat should come from plants. If you are serious about setting new goals for yourself and improving your diet, you should get yourself a copy of my new guide, called the Cancer Risk Reduction Guide, which will give you clear guidelines on how to eat a diet to prevent cancer. 4. Limit consumption of ‘fast foods’ and other processed foods high in fat, starches or sugars. As a public speaker, I have several topics that I present. One of the most popular talks is on the subject of “Fad Diets” for cancer. During this talk, I review the claims around various diets that are recommended as cancer cures; The Alkaline Diet, The Budwig protocol, Gerson therapy, Paleo, Juicing and Macrobiotic. While they all have claims that they will cure cancer to varying degrees, the actual diet programs contradict each other. What I find really interesting is in areas in which they intersect, which is – they all recommend that you avoid processed foods and eat real food. If these diets do help you to be healthier, that’s one of the big reasons why. 5. Limit consumption of red and processed meat. This does not mean that you have to become vegan (not that there’s anything wrong with that). The AICR recommends a limit of 12 to 18 oz (350-500 g) cooked red meat per week but little if any processed meat. 6. Limit consumption of sugar sweetened drinks. The question ‘does sugar feed cancer’ is one that I hear often and I could give a quick yes or no answer to this, but in truth I find it is rather nuanced and depends on what you think ‘sugar’ is. I go into some valuable detail to help you understand this relationship between sugar and cancer in my 4-part blog Does Sugar Feed Cancer? 7. Limit Alcohol Consumption, it’s best not to drink at all. It won’t matter if it’s organic or not, because it’s the alcohol that is the carcinogen (cancer promoting agent). According to the AICR, there is no ‘safe’ limit. 8. Do not use supplements for the prevention of cancer. This doesn’t mean, ‘don’t take supplements’ it means, don’t take supplements thinking that they will protect you from cancer. It’s your diet that matters. 9. For mothers, breast feed your baby if you can. If you need help with breast feeding, then make sure you get it. I found the public health nurse in my area was the best support for me when I had questions and needed help. 10. After a cancer diagnosis: follow these same recommendations, if you can. Right now, the diet recommendations to prevent a first cancer are the same as the ones to prevent a cancer recurrence or spread. I detail these recommendation in the food guide that I created specifically for cancer survivors, you can read more about it here. 11. All cancer survivors should receive nutritional care and guidance on physical activity from trained professionals. This recommendation is my personal favourite. Having worked with many clients, I can tell you that there is a real improvement in not only what they eat, but how you understand the cancer-diet relationship and the sense of ease that can come with as little as a single session. When I want to get my best workout at the gym, I work out with my personal training. Think of the registered dietitian that specializes in cancer risk reduction as your personal food trainer. Can these recommendations prevent cancer? “A growing number of independent studies shows that the more closely people follow our Recommendations, the lower their risk of developing cancer”. For myself, as a cancer survivor, I’m not going to wait for definitive proof, I’m going to do what I can to follow a cancer risk reduction diet, and exercise routine today. 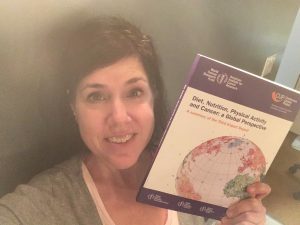 I am happy to have my hard copy of the WCRF 3rd Expert Report on Diet, Nutrition, Physical Activity and Cancer.